"Good health starts with a good foundation"
Carol Bucci is our Certified Personal Trainer. Carol has been a personal trainer for 16 years and has loved every second of it. She has had the wonderful opportunity of working with a large range of people - from strong athletes to those that have major back or joint problems. She enjoys training the clients that come to her truly wanting to work out, but lack the knowledge of proper form and posture. Often times, these people have joint issues and muscular pain. She won't just tell them what to do, but how to do things correctly to avoid injury while increasing strength and endurance. Showing them the wrong way and then the correct way before they start each exercise helps clients become mindful of what they should and should not feel in their muscles and joints. They become more confident both mentally and physically. She will determine specific weaknesses, tight muscles, and faulty movement patterns that may be causing your problem and then teach you how to correct them. She will give you a program to follow at home or at a fitness facility with written instructions. She provides both individual and group personal training at her private facility at Greater Rochester Chiropractic. 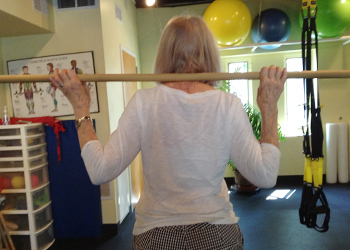 This 84-year-old patient is proudly showing her improvements in posture and balance after training two times per week for 8 months. 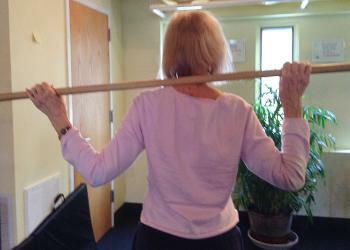 She had undergone knee replacement surgery just before her training with Carol began. Carol Bucci is nationally certified through ACSM, AFFA and the YMCA. She also has Kickboxing Certifications through AFAA, YMCA and Turbokick.